When writing up recipes for the Star, I knew that what people were asking for wasn't what they really wanted. Recipes from chefs are a staple of food media. “Learn to make BLANK just like chef BLANK” is a crowd-pleaser that can be replicated anywhere, any time. But it’s dishonest hucksterism, barely above the old comic book ads for x-ray specs or sea monkeys. Because you can’t cook like a chef. Because you’re not a chef. That’s not an insult. But you can’t clean teeth like a dentist or drive like a Formula 1 racer. Why would you be able to cook like a chef? After cooking professionally for seven years, when I began writing about food for the Toronto Star, some of my colleagues called me “chef.” They were being affectionate. But I’d ask them not to. Because I was not a chef. The title of chef is earned through years of hard work, repetition, study, and leadership, not by putting on a paper hat, getting a pig tattoo, or yelling “Bam!” And the prefixes of “Master,” “Top,” and “Iron” are not ranks. They are trademarked game show titles. If Craig Harding’s pasta is “incomparable,” it’s because his restaurant makes fresh spaghetti every day, which this recipe lets you skip. If Suzanne Barr’s Jamaican patties are easy, it’s because she’s a professional with 12 years of experience. Tom Thai’s ceviche is simple, once you’ve bought the saw tooth, shiso leaf, togarashi, and yuzu juice. While editors write the headlines, I’m as guilty as anyone for contributing to the chef-recipe scam. That recipe for sea bream ceviche was one that I wrote. For a couple different Star columns, I would routinely collect, test, and write up recipes from chefs. The process usually began with asking the chef how some favourite dish was made. They would start with the importance of where they bought their lamb/tuna/mozzarella/grits/shrimp or whatnot, how they’d sourced a product that was bigger or smaller, fresher or juicier or more humanely raised or just plain better tasting. Then they’d explain how it was cured, marinated, smoked, braised, dehydrated, or some other method that was simple for them but often involved uncommon equipment or advanced prep time. Curing, for example, is usually just letting something sit in salt overnight. But to the home cook, the instruction reads as a recipe that takes 24 hours. And regular people are trying to put dinner on the table in 20 minutes. After that, the directions would fold in the other six or 10 elements on the plate — pinches of dehydrated pumpernickel powder or finely sliced guajillo pepper, crispy chickpeas or garlic, dashes of fermented chili paste or just a simple handful of sea asparagus — that usually required small amounts of ingredients the average person doesn’t have. A standard fancy restaurant dish is actually five recipes in one. And we know you’re not going to clarify a pork Thai consommé, deep-fry a fish carcass to plate ceviche, slice Hakurei turnips on a mandolin, or spend time on other kitchen chores that require patience and planning. A home cook might be willing to brine but only if it’s for fried chicken. In one instance, I wrote a recipe with no intention for anyone to make it at home, just to show the labour that went into a $7.99 bowl of noodles, giving directions to find ingredients — 1 strip of Angelica dahurica root, 3 pieces dried Alpinia officinarum, 4 pieces rhizome of galanga resurrection lily, 2 inches cassia peel, 10 dried fructus piperus longi, 8 dried fruit of villous amomum, 2 dried tsao-ko amomum fruit (a.k.a. 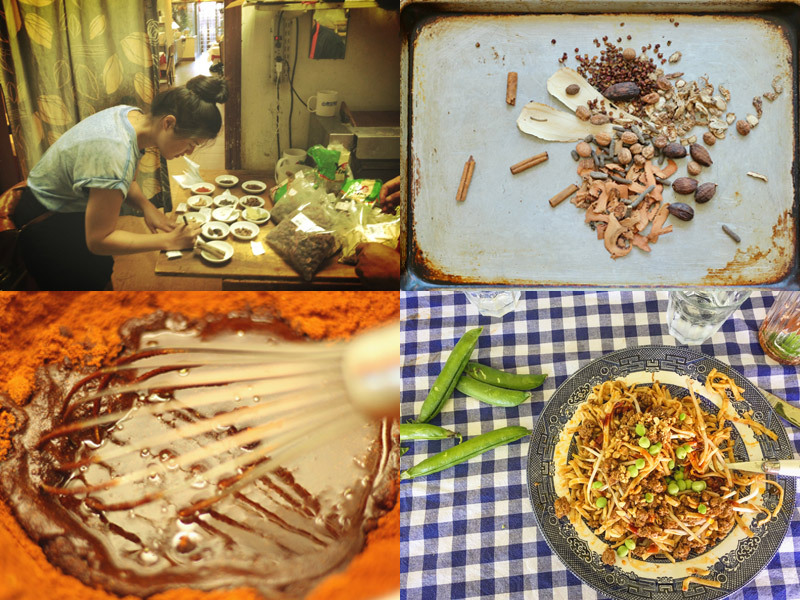 black cardamom) — for a chili oil that was only one third of the northern Chinese dish. Star reporter Jennifer Yang helped translate for Corey so he could learn how to make the dan dan noodles from Toronto’s Chinese Traditional Bun. He also took these photos. Some readers will try ambitious recipes. One reader even made the dan dan noodles. But most of the time, the recipe has already been dumbed down before it even gets to the reader. I always would have preferred to represent a chef’s recipe as faithfully as possible. But no home cook would ever make that, or even read to the end of it. I knew that what people were asking for wasn’t what they wanted. And when you get emails from readers, telling you that a dish turned out well, that it fed their loved ones, that’s a beautiful feeling. So after hearing the complexity of a popular dish, I’d ask the chef for an easier recipe. (When I went to Grand Electric to ask how to make their pig tail tacos, I was like, “No way will anyone do this.” So I presented their chips and guacamole recipe instead. Like the world needed another guacamole recipe.) And then we’d take that easier recipe, and we’d make it easier still, by skipping a couple steps, eliminating the garnish, sauce, or other handmade elements that made the food what it was. You know how restaurants make things crispy? They deep-fry them. You know how to do that safely at home? Use a heavy-bottomed pot and fill it no more than one third with a high-smoking-point oil. But because everyone is terrified of a shallow pot of boiling oil, deep-fried items are usually changed to pan-fried or baked, readers left to wonder what sorcery the restaurant employs to make things so crispy. And then I’d test the recipe, using a stopwatch to time each cooking stage. Every food writer and editor I worked with at the Star was very conscientious about testing. Always concerned about the reader, they’d make it again if it didn’t turn out right the first time. North Americans used to cook every day. Now we eat out and order in more than we cook at home. We’re not developing skills the natural way, through repetition. So if it gets people cooking, a little recipe hand-holding is fine with me. But the celebrity-chef recipes are a deception. The chefs get promotion and the publication gets runoff chef glitz and the reader gets swindled. For every genuinely helpful tip from a chef, like Gordon Ramsay’s scrambled-egg method — moving the pot of eggs on and off the heat, stirring, to coax softness out of them — there are 10 pieces that are just fawning profiles of celebrity chefs disguised as recipes. You would never be suckered into believing you could perform a coronary bypass like a cardiothoracic surgeon. So why would you think you’d be able to cook like a chef? Corey Mintz is a freelance food writer and frequent columnist for The Globe and Mail. Top photo of Tara Podaima teaching him how to carve jamón ibérico at Winnipeg’s Segovia Tapas Bar taken by Victoria Ptashnick.